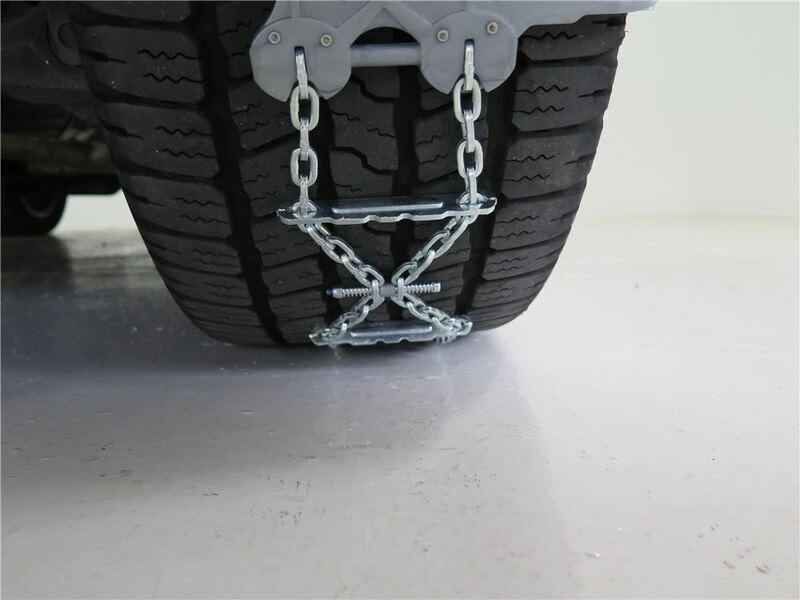 Because they are designed to ride solely on your vehicle's tire tread, these chains are the perfect solution for trucks or SUVs with limited wheel-well clearance. 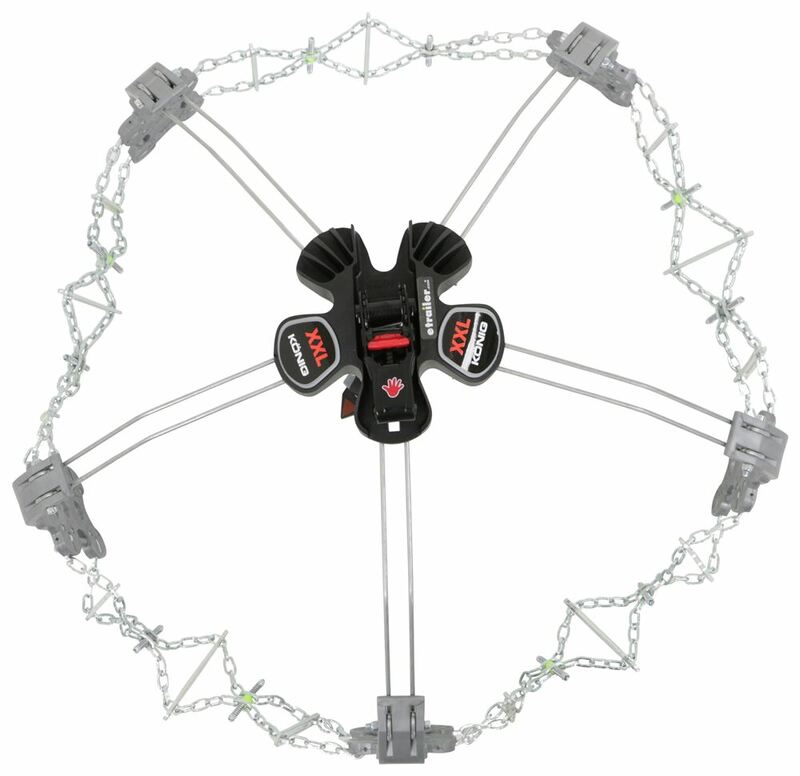 Chains automatically tighten and align as you drive for the simplest installation. Lowest Prices for the best tire chains from Konig. Konig Premium Self-Tensioning Snow Tire Chains - Diamond Pattern - D Link - K-Summit XXL - Size K77 part number TH02230K77 can be ordered online at etrailer.com or call 800-298-8924 for expert service. 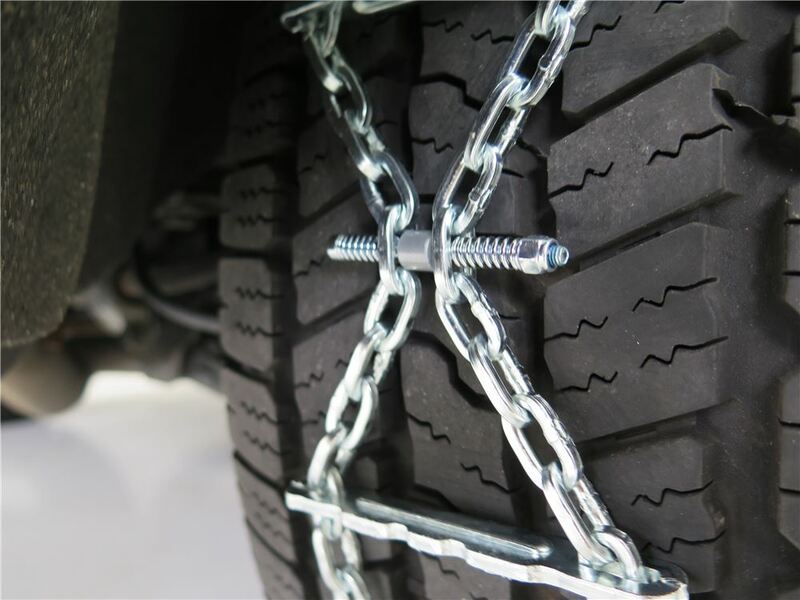 Because they are designed to ride solely on your vehicle's tire tread, these chains are the perfect solution for trucks or SUVs with limited wheel-well clearance. 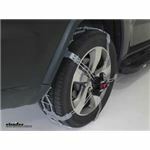 Chains automatically tighten and align as you drive for the simplest installation. 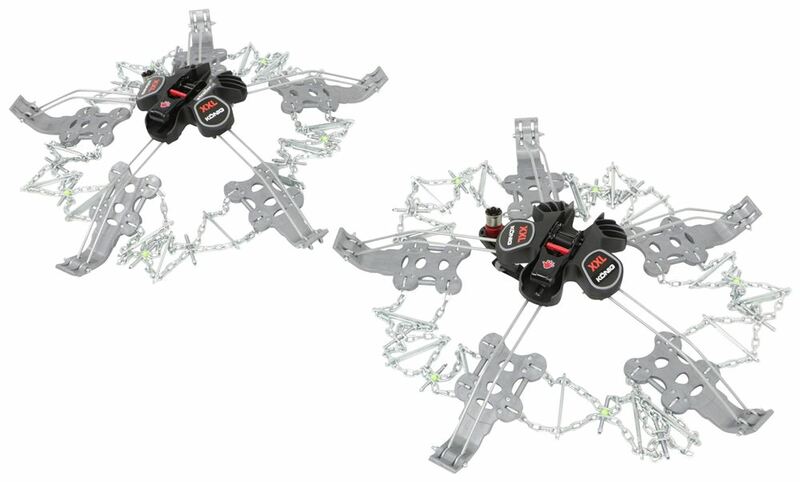 Form meets function in Konig's K-Summit tire chains. 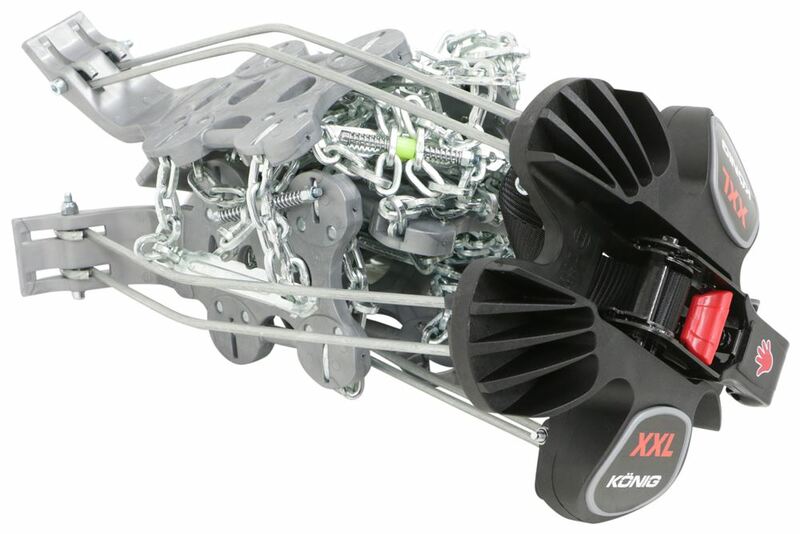 Unlike typical snow chains, the K-Summit chains require no attachments behind the wheel. 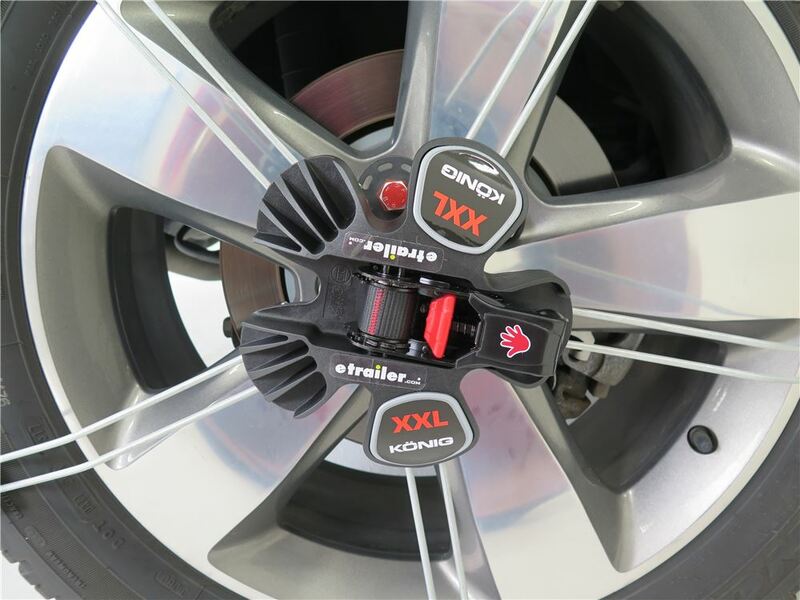 Simply place two of the traction plates on top of the tire and fasten the K-Summit XXL to the wheel's lug nut or bolt with the easy-to-use fixing key. Activate the chain's ratcheting mechanism and you'll be ready to roll. 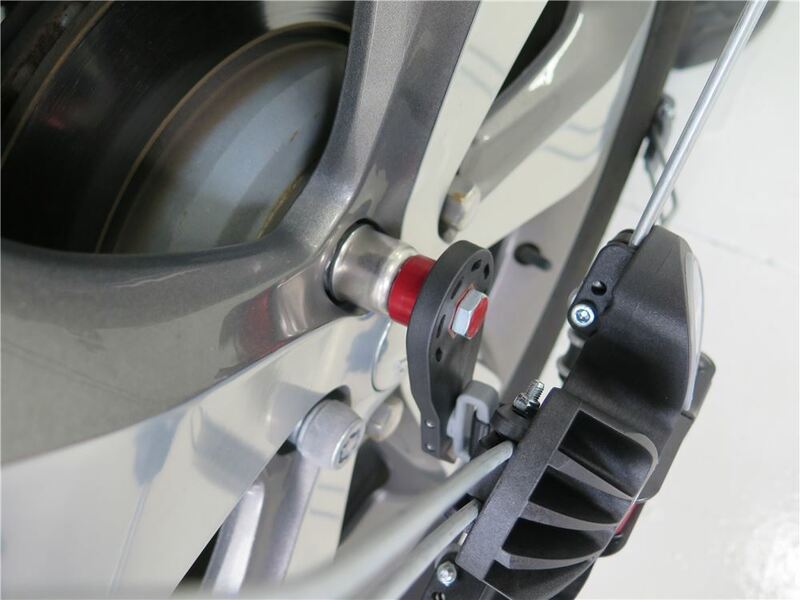 As you drive away, the traction plates clamp onto the tire surface, and the chain adjusts to conform to the tire perfectly, providing a precise fit even on worn tires. 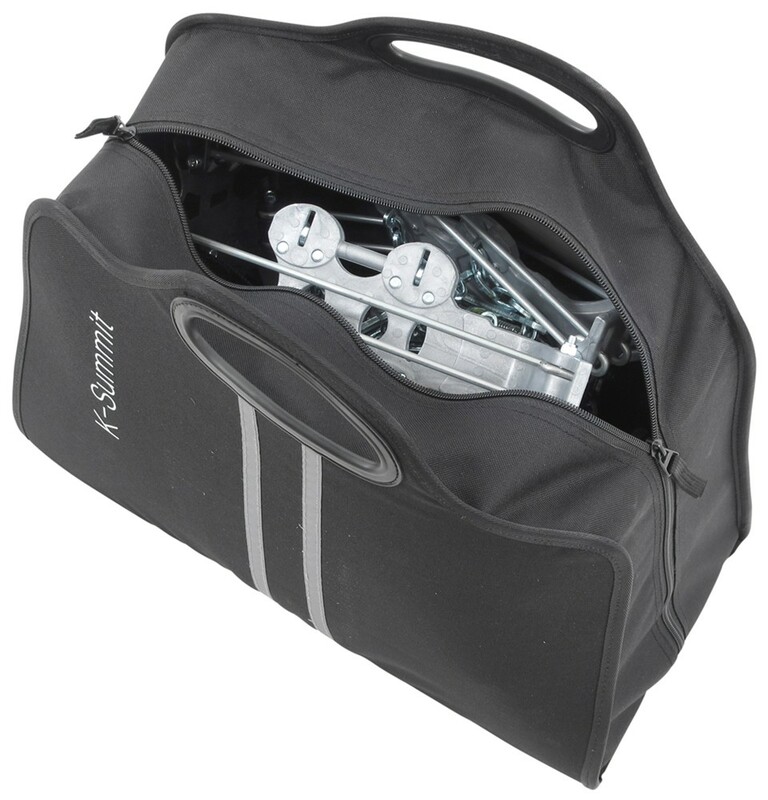 After use, fold up the tire chains and store them in the compact, reusable carrying case. 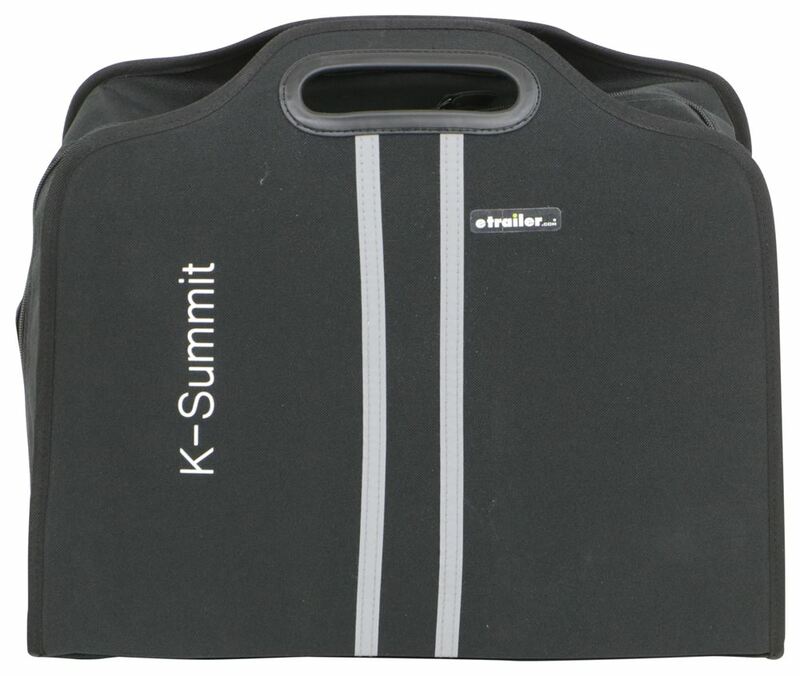 The K-Summit XXL delivers an extremely user-friendly design. 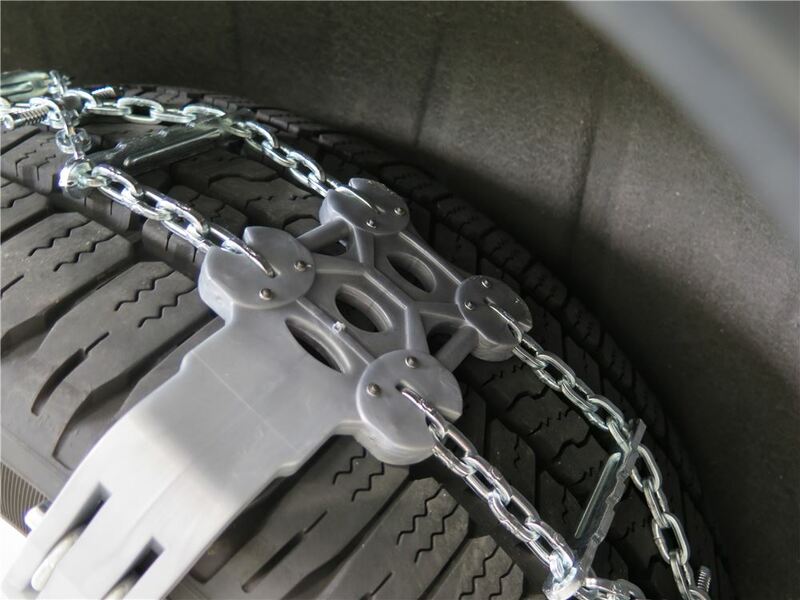 Each chain sits on top of your tire's treads instead of wrapping around the entire wheel. 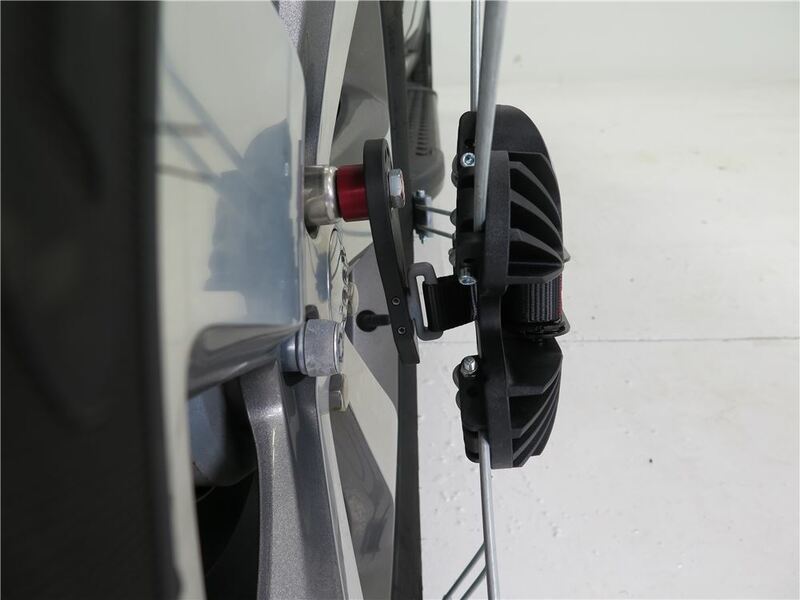 This design not only eliminates the threat of scratches to your wheels, but it also ensures that there is no interference with any suspension or braking components on the inside of the wheel well. Konig snow chains are handmade in Italy of hardened manganese-nickel alloy steel for durability. 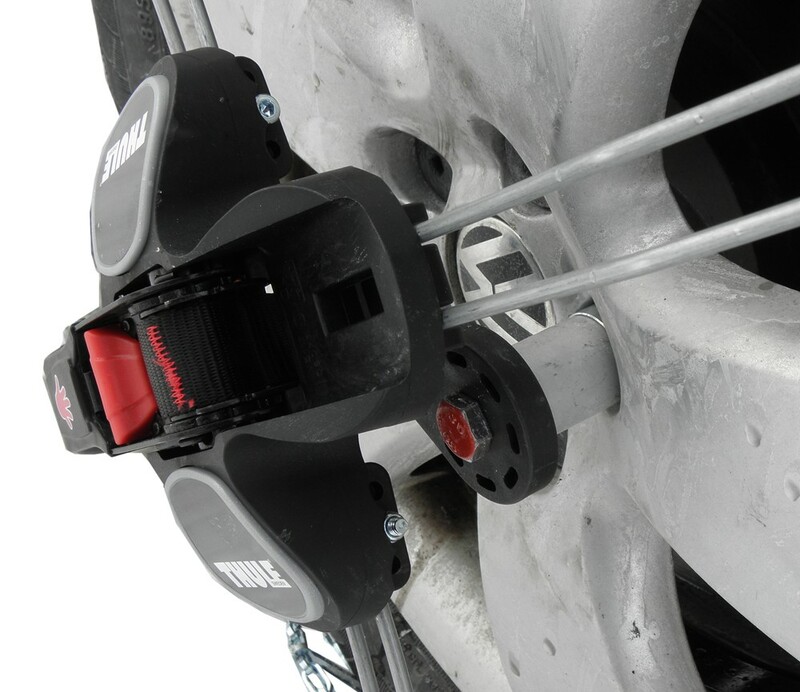 The reduced-clearance, D-shape links provide superior traction for excellent grip on snow and ice. The durable plastic traction plates have metal studs to give you superior grip while also providing a high level of driving comfort. Lay 2 of the chains traction plates on top of the tire. Attach chain to 1 wheel nut. Activate the ratchet, which tightens as you drive away. 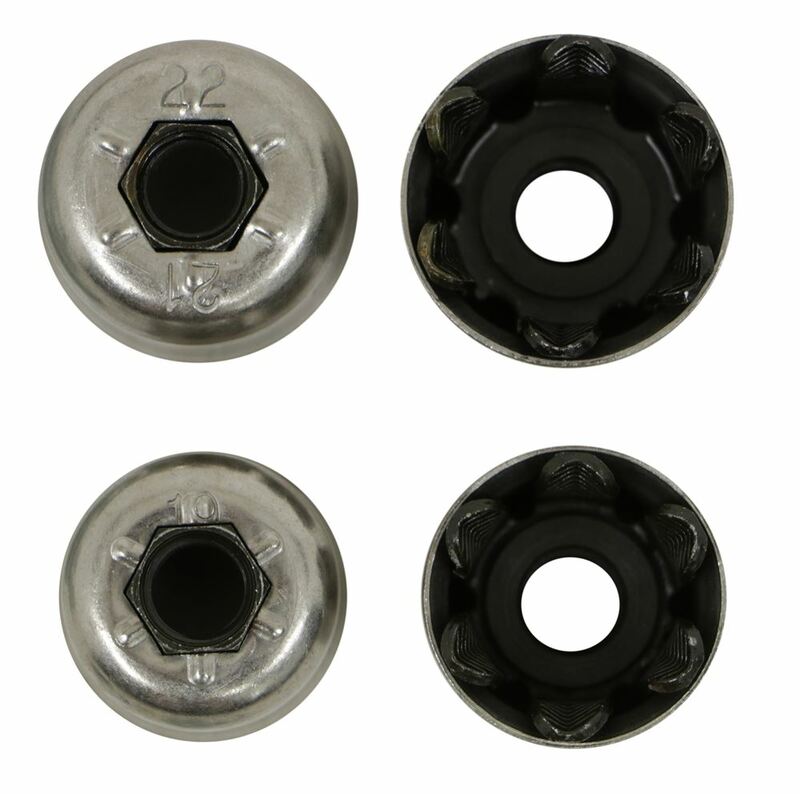 Attach the lug nut adapter that matches your wheel bolt size to the fixing key. 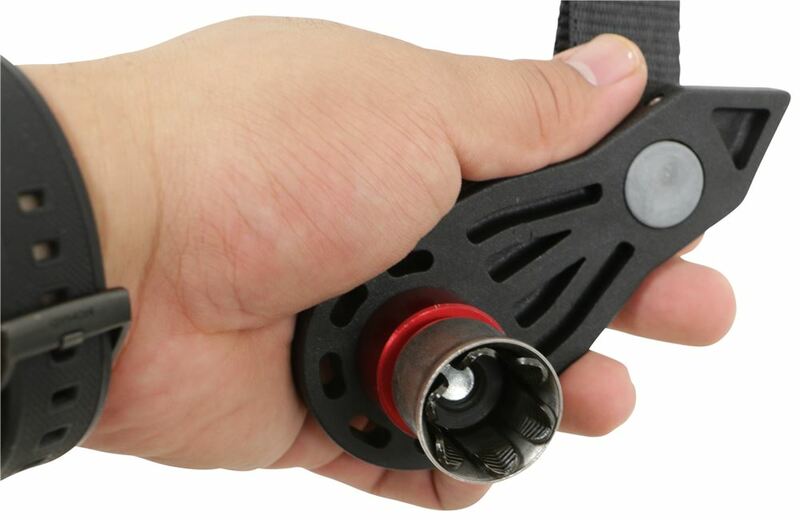 The most commonly used adapters are included with your K-Summit snow chains. (etrailer.com's custom fitguide will indicate whether your vehicle requires an adapter that is sold separately.) The fixing key then mounts to the wheel bolt on the end where the adapter has been affixed. 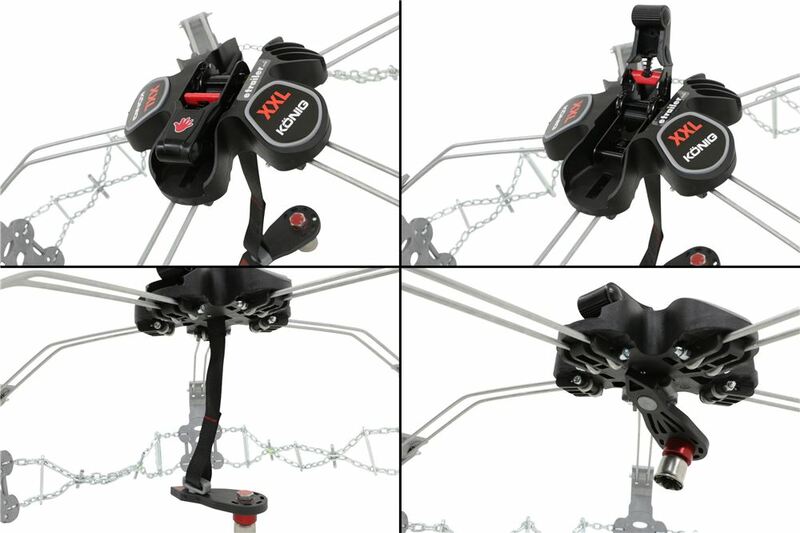 The other end attaches to the K-Summit base, which includes the ratcheting mechanism that tensions the chains as you drive. Speaker 1: Today we're going to be taking a look at the Konig Premium K-Summit Self-Tensioning snow tire chains. These have the diamond pattern and D-Links. They do a great job of giving you the traction that you need, they offer the diamond links up here, they've got ice breakers all the way throughout and really nice studded traction pads. So, overall these are gonna give you excellent traction, they're gonna fold up nice and conveniently, they're gonna be very easy to put on, so you're gonna spend a lot less time laying down in the snow or rolling around trying to get these on in the emergency situation when it comes up.Now when you first see these tire chains, they can look a little bit intimidating but don't let that fool you. You're really .. once you get your initial set up done and get 'em sized properly, all it's gonna take is for you to tighten up one nut right here, which holds our anchor point and then ratchet 'em down to the tire. At that point, you drive forward, they're gonna self center on the tire and they'll hold themselves in position until you're ready to take 'em off. You can see we have spring loaded self tensioners here as well, that's gonna maintain tension even if your tires are wore down a little bit, if you happen to have a little bit under pressure situation or something like that, these are gonna spread out slightly, keep that proper tension on to keep these chains working as they should.Now the D-Links that they speak about are here. You can see they offer a good edge on each side which are gonna help to bite and grip in that snow. These give us excellent forward and backwards traction but also side to side, the way these diamond patterns are formed, it's gonna give us unilateral traction. And for the icy conditions, these are the ice breakers we spoke about just a few minutes ago, these are gonna really cut in deep to that ice, break it up and help to ensure that we don't have any issues with slipping.You'll also notice the rivets or I think they're more like a stud that's in our traction pads here, at each point you're gonna have several of these on here also helping to grab ahold and get great traction. I think you're gonna see this tire chain used in applications where you use them often and you don't wanna be rolling around in the snow to get 'em attached, but also on our Grand Cherokee here, these are very nice rims, we don't wanna run the risk of anything making contact with those that might do damage. You can see the way they arch out here, we have zero room contact whatsoever, our anchor point is gonna be right there on that lug nut so it's gonna be ideal on aftermarket rims or any type of rim that you're concerned about.Now these chains are made to be extremely durable, you should get a lot of good service out of these. The links themselves in our ice breakers, these are gonna be a manganese nickel alloy, very, very durable but extremely corrosion resistant and on our traction pads here, not only do those rivets help give us good traction but they prevent wearing of that pad.There's something I like about these chains that you don't see with a lot of other tire chains, that we don't have anything on the back side of our tires here. So our brake lines, ABS sensor lines or wires and things like that, really aren't gonna be an issue at all. Now when choosing the axle to put your tire chains on, of course they're gonna come in a quantity of two so you'll get one for each side of the vehicle but you always wanna put 'em on your drive wheels first. If you're gonna get two sets, put 'em on all four of course but if not, put 'em on your drive wheels. So on a rear wheel drive vehicle, they're gonna go on the rear. A front wheel drive vehicle, they're gonna go in the front and an all wheel drive situation, typically your front axle is your drive axle but check your owner's manual to make sureNow just to keep your chains performing well for a long time to come, there's a couple things you wanna do. The first is not exceed 50 kilometers per hour which is gonna be about 31 miles per hour, of course in those conditions we probably shouldn't be doing that anyway. And the second is when you take these off, hose 'em off. Get any of that road salt and that grime off of 'em so it's not constantly sitting on our chains, let 'em dry in the sun and then repackage 'em.As you can see, the K-Summit Chains, they're gonna come in a nice carrying bag so you can keep 'em stored in your vehicle for when you need 'em and a lot of other chains that you're gonna find, you don't see quality like this. Generally you're gonna have a very low quality . just a little zipper bag and it doesn't really hold up all that long. There's gonna be a pocket inside, this is gonna allow you to store your instructions, your different lug nut adapters, your tools, but also it's gonna come with a set of gloves . help protect your hands and kneeling mat. Now, to be honest with you these aren't the highest quality gloves or kneeling mat there, might be a good idea to keep just a towel with you and a pair of work gloves just to get these installed if you don't wanna touch 'em.Something else I like, is this little emergency hardware kit, basically anything in here you can do with a pair of pliers and if in the event for some reason one of your links we're to break or something, we'll be able to make a repair with that, won't leave us stranded. 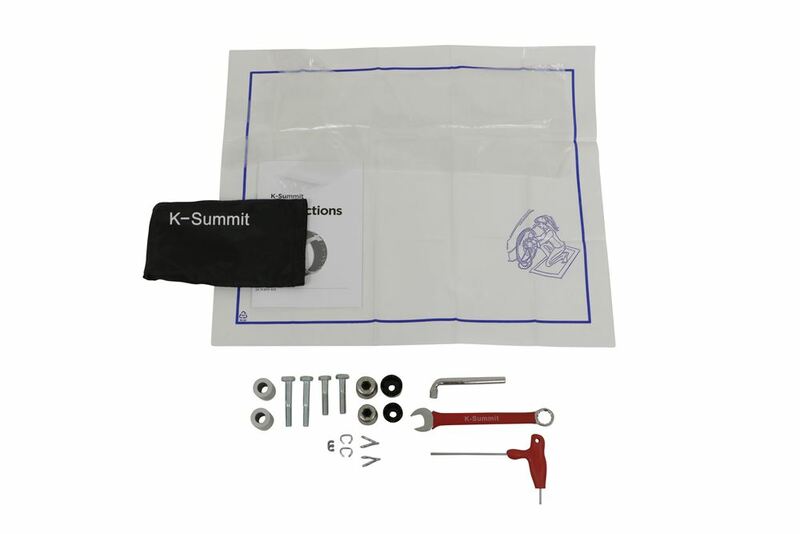 Now there are several different sizes of the K-Summit Chains so it's important for you to check your tire size and put that in the fit guide so we can get the right one to you. If you don't know your tire size, your best bet's just to look right around your rim, usually it's gonna start with either a P or it's gonna start with an LT. It's gonna give you three digits, two digits and then two more digits. In our case we're looking at a P-265-55-R20.Now when you get set up to do your installation, the first time which is always recommended to do it on a nice day when it's sunny out. You need to get the tire chain set up for your particular tire. 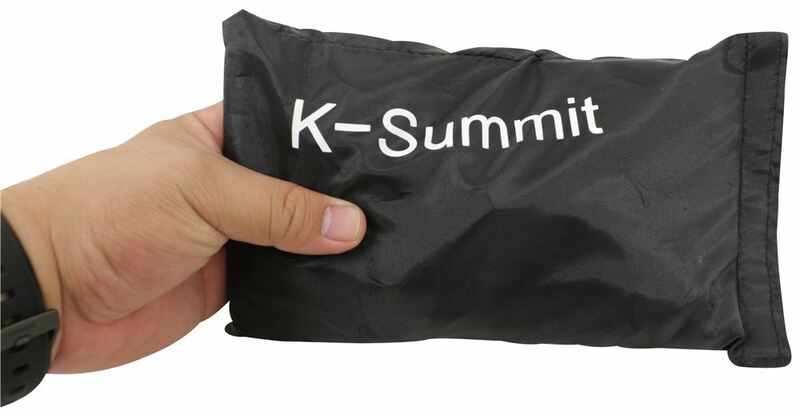 These are made to fit several different tire sizes so if you'll use your instructions, you wanna find your part number in this case we're using the XXLs, these come in just the standard K-Summit, XL and XXL depending on tire size. We're using the K-77s so we'll find that right here, 265-50-R20 and it says that we need to remove two of our size adjusters. Those are gonna be the spring loaded bolts that have the yellow, you can see the bright yellow insert there between 'em. So it says we need to remove two of those, depending on your tire size you may not have to remove any, or as many as five.The tools are provided to do that. So we've got our wrench here, that's gonna go over the nut, then we've got our Allen key, that's gonna go on the bolt head side, then we'll just get this loosened up. And now once you get this off, put it in your kit that way if you ever change your tire size, if you need to add these back on you can. You can see that little nylon lock nut is what we removed there. Alright, so we've got 'em sized properly now. The next thing we need to do is find the proper cup and anchor that fits over our lug nut. Now on the end of 'em, this one says 21, 22, got one for 19, you're gonna have one for 17. That's in reference to millimeter, you just wanna find the one that will easily slide over your lug nut but that you can't turn. You don't want it to be too big and you don't want it to be too small. See that one sits on there really well for us, so that's the one we're gonna use.You can see here, we're using the red anodized spacer, our lug nuts stick off a pretty good distance for our wheel so I think this is gonna be all we'll need to do but we'll show you when we put this on, how you might have to add a single or double insert depending on how your wheel's set up. Now you'll wanna grab two of the arms, we're gonna place that right up and over our wheel and kind of guide the other ones around the wheel as best you can, of course it's not gonna go all the way around. That'll take care of itself in just a few minutes. You'll notice once we have that in place, it's just gonna kinda hang on there so we won't have to worry about holding it.The next step's getting our anchor point set. And you'll notice as I slide that on, I've got a good distance between the back of this anchor and my rim, that's what we're looking for. So, if your lug nuts are inset, or let's say your rim, maybe the face of your rim's here and your lug nuts are down in there further, then you might have to switch the red spacer to the silver spacer. You can see that's gonna give you additional room, now keep in mind when you do that you're gonna need to go up to the medium sized bolt which we have here. We've got the short bolt in here, got a medium sized bolt if we're using the silver spacer and if that still doesn't give you enough room you can use both the red and the silver spacer, but then you have to use the longest bolt. Just something to keep in mind there.Now with our setup the way we want it, we're gonna place that over our lug nut. We want the red arrow, you can see it right here on the end of this black piece, we want that to face towards the middle of the wheel and we'll hold that in place while we tighten down our nut. Now the tools gonna be provided, it comes in the kit and it's something you'll keep in there all the time. You can see we're just gonna tighten that down, as we do it grabs ahold of that lug nut. Alright. So that's on there nice and secure. At this point, just need to start ratcheting our strap here. You'll notice those arms are gonna flex. Just put that down in the stored position.At that point, your tire chains are installed. You just need to drive and as you do these are gonna work their way on and under the wheel. Now, not only is getting the chain on really easy, getting it off is just as easy. We're gonna pull the red lever right here and we want to fully open this buckle while holding it. You see how it kinda tipped out, now we'll just pull out slightly, that's gonna relax our strap here in the back and we'll use the provided tool to loosen up our bolt. Once that's loosened up you'll see that move just slightly, we can pull that off of our lug nut and just kind of work our chain off. Now we'll wanna allow that to rest to the side, get our other side done, we pull forward, we'll be ready to package it back up.And that's gonna complete our look at the Konig K-Summit Premium Self-Tensioning Snow Tire Chains. 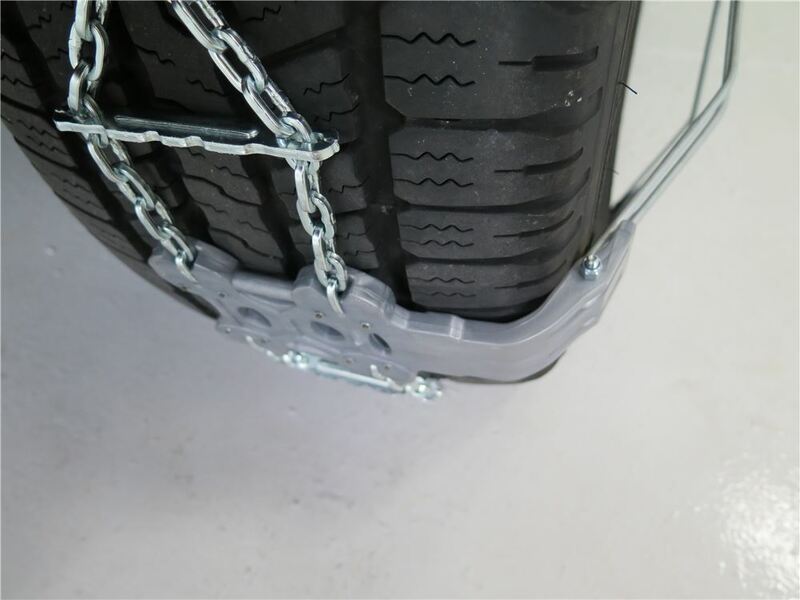 Order: RelevanceNewestRating - High to LowRating - Low to High Because they are designed to ride solely on your vehicle's tire tread, these chains are the perfect solution for trucks or SUVs with limited wheel-well clearance. 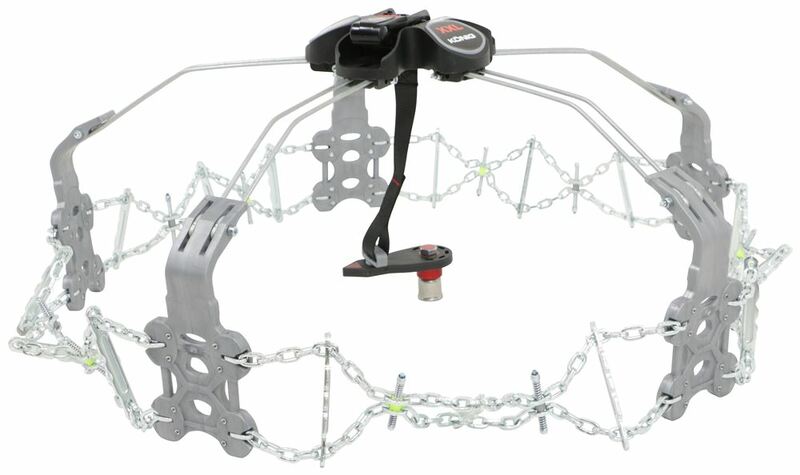 Chains automatically tighten and align as you drive for the simplest installation. These worked great. The first time I used them, I didnt tighten the screw enough and one of the chains came off while driving. But after learning to tighten them enough, I had no problems. It was a mild winter, but at least I know that driving 20 miles in 5 of unplowed snow up the mountain highway isnt a problem. And I finally figured out how to get them back into the case. We have one set of tire chains that will fit your tire size of 275/40-22 that you have on your 2016 Range Rover Sport. For that you would need the K-Summit Chains part # TH02230K77 which are a fit, install easily, and offer the best possible wheel clearance around. In your tire size there really isn't a low price option. The only fit we have is the Thule K-Summit # TH02230K77 which will give you excellent traction, will install easily, and will have the best possible tire clearance but the price is probably more than what you are interested in. For a Snow Sock that will fit we have the part # TCH74. I did some checking and the only tire chains that will fit the 315/40-21 tires on your 2017 Mercedes GLE are the Konig K-Summit chains # TH02230K77. The K66 chains will not be large enough. 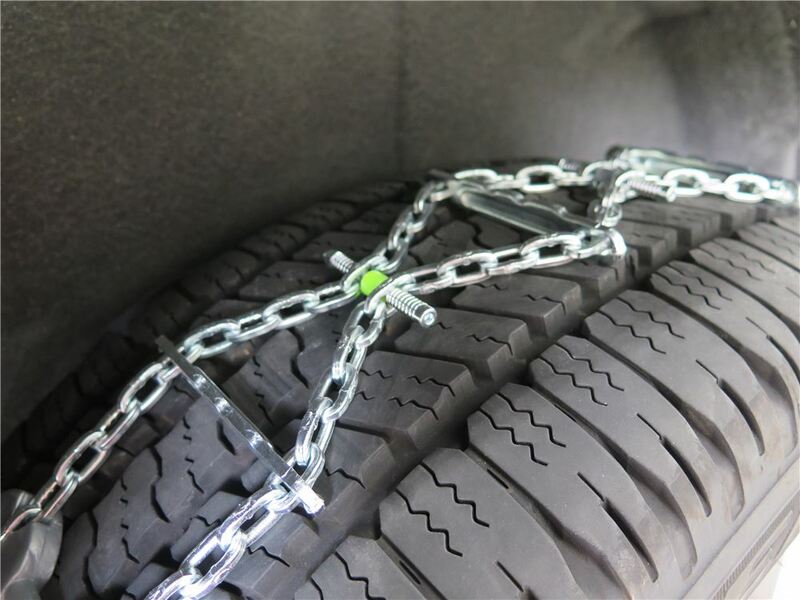 On your vehicle the chains will install on the rear wheels only. 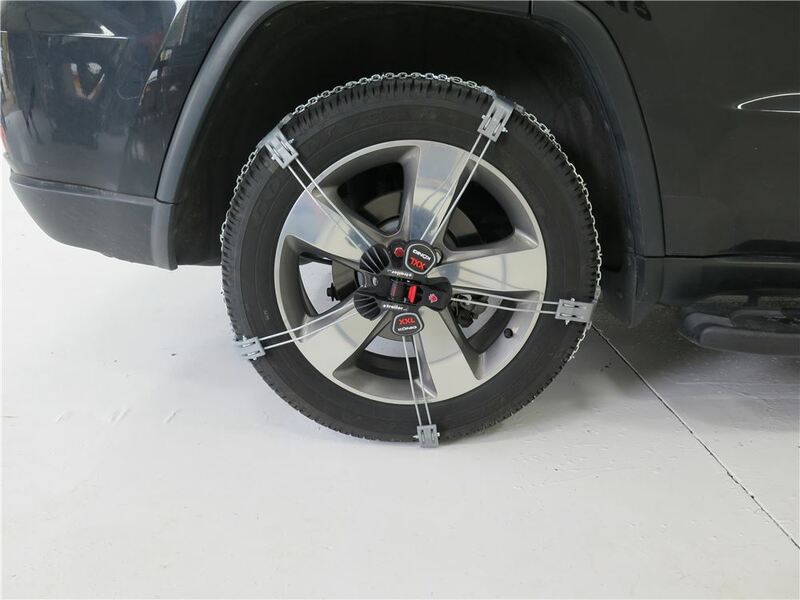 Yes, the Konig K-Summit tire chains part # TH02230K77 that you referenced is a confirmed fit for your tire size of 235/55R20 that you have on your 2018 GMC Acadia. I looked up your lug nut size and you would not need that adapter either since you have 22 mm lugs and this comes with a fit for that size. I am not sure what tire cables you currently have so I can't really look up what size they'd fit and if they'd fit your current size of 275/40-22. The only set of tire chains we do have that fit this size is the part # TH02230K77. 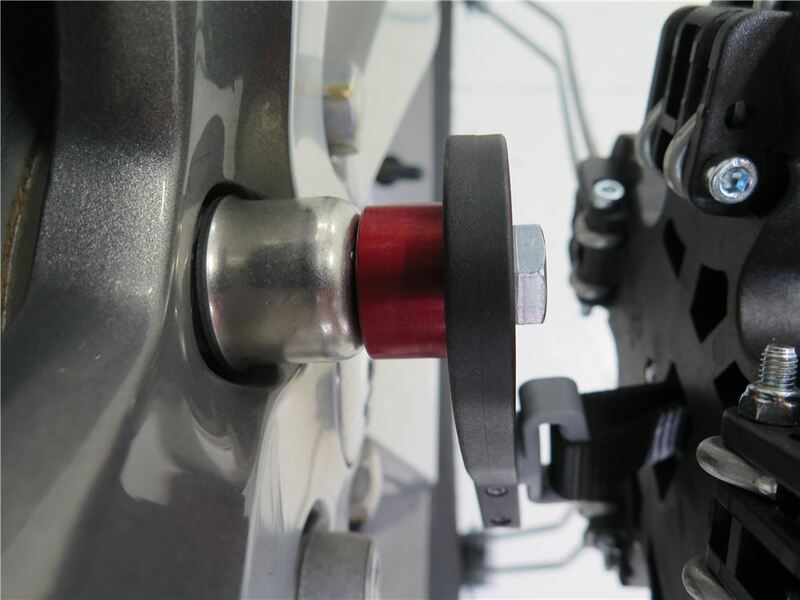 These are the best set for low clearance requirements as they do not go over the inside shoulder of the tire at all which basically means they do not require any clearance. 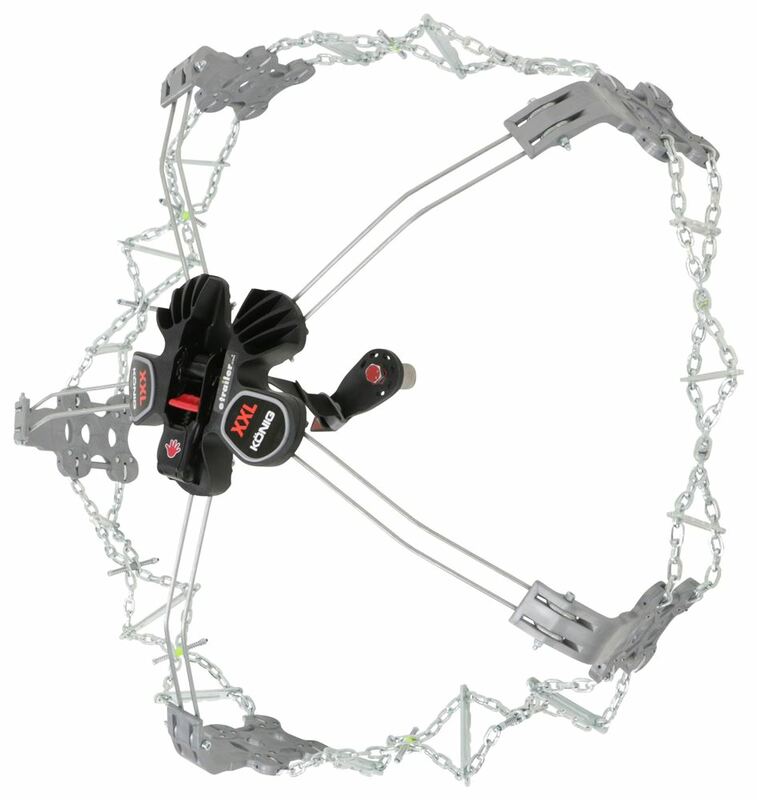 I checked with the manufacturer and Konig Premium Self-Tensioning Snow Tire Chains - Diamond Pattern - D Link - K-Summit XXL - Size K77 Item # TH02230K77 are not a fit for your 275/55-20 tires but we do have other chains that will fit. I have included a link to them below. The options that require the least amount of clearance around the tire are the cables such as # PW2028C or chains # TC2327. When their tire chains are installed on a vehicle, Thule does not recommend driving above 50kph, which is about 30mph. 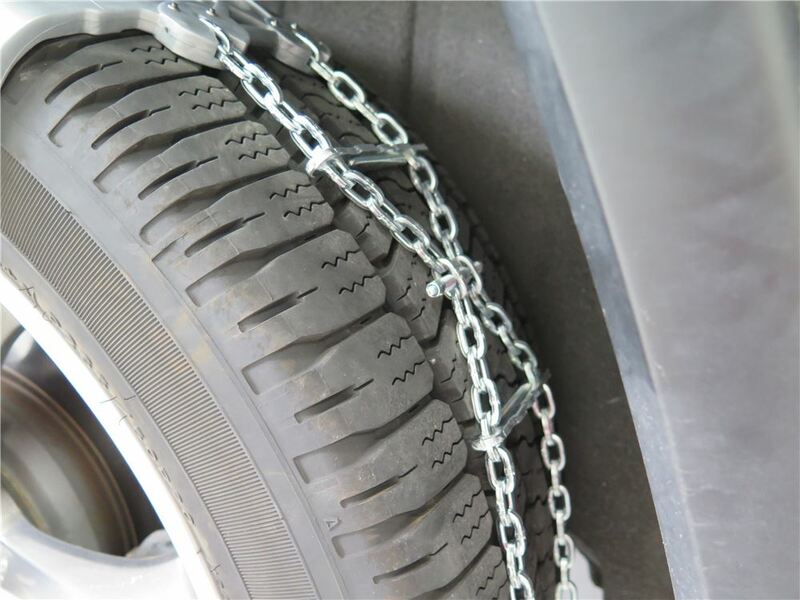 For more information about tire chains, check out the FAQ articles I've linked for you. 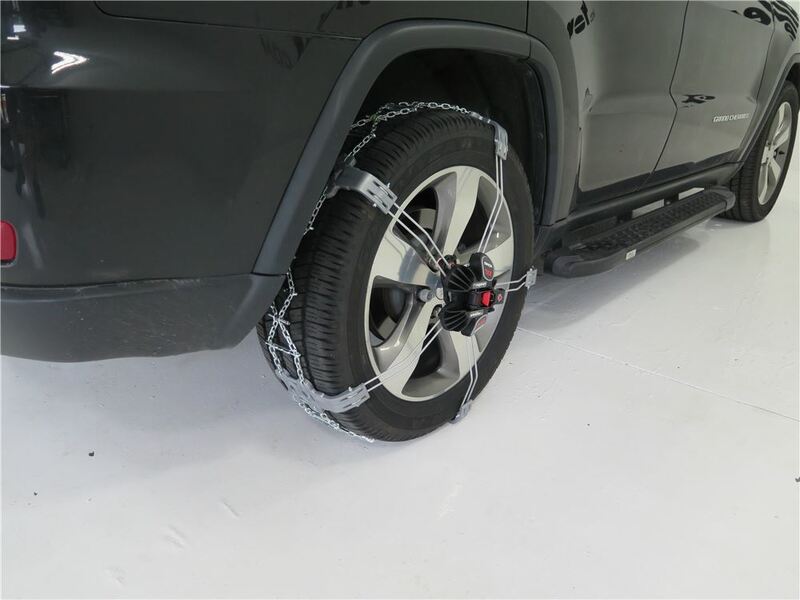 According to the owner's manual for the 2017 Toyota Tacoma you will need to use chains that have side chains up to 5mm in diameter and cross chains up to 6.3mm in diameter. The Thule chains that require the least clearance are the K-Summit chains # TH02230K77 which have no part of them between the inner sidewall and the vehicle so I recommend them. 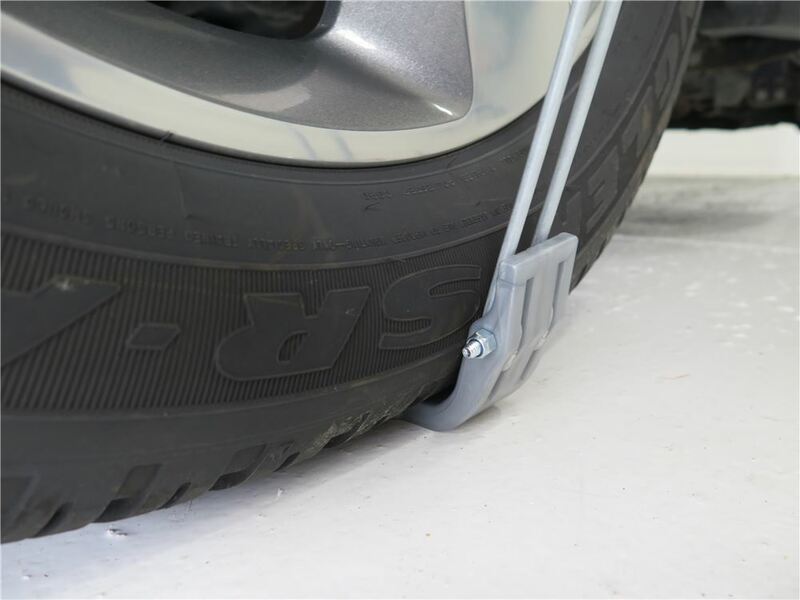 For your tire size P255/55R20 there are no tire cables available, but for a set of chains that would provide you with excellent clearance the Thule K-Summit chains part # TH02230K77 have been confirmed as a fit. 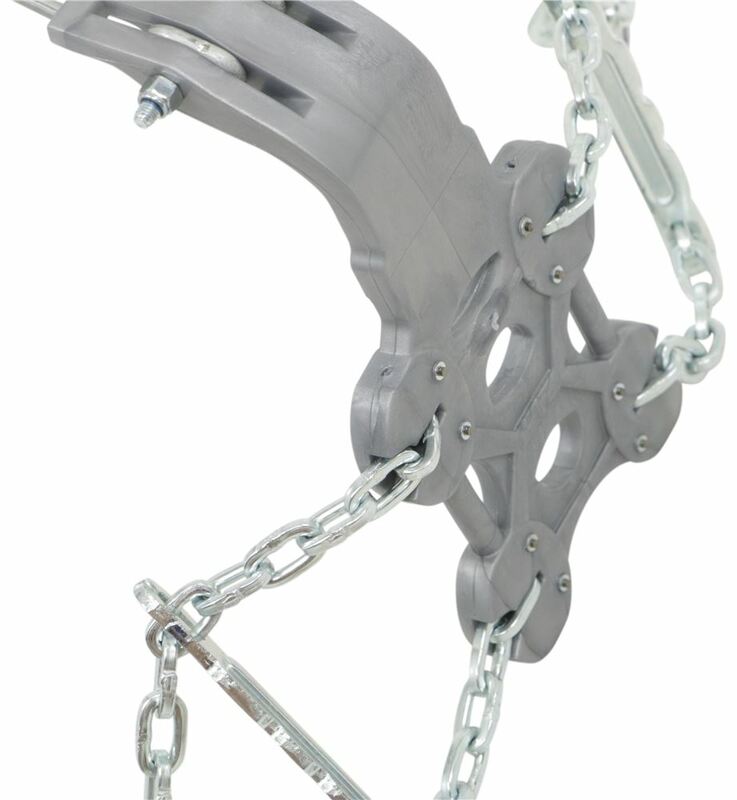 These chains are great because they install easily, they require zero inner tire clearance and have a 5 year warranty. K-Summit tire chains # TH02230K77 do fit tire size 275/45-21. But you will want to check your vehicle owner's manual because you can't always use tire chains with snow tires. The manufacturer of the tires may also have restrictions. Even if the circumference is the same amongst those tire sizes, the distance from the tread center to the middle of the wheel is going to be different. So the 5 arms that come down off the tread can only reach so far. Thule does not make any chains that will fit a 285/60-18 tire but we do have other chains that fit. 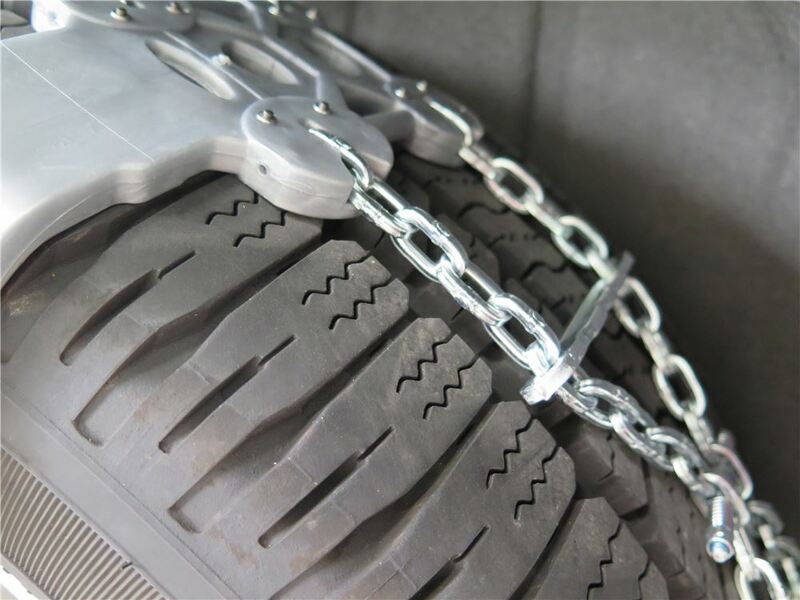 I have included a link to our informational article on tire chains for you. Be sure to consult the vehicle owners manual for specific information on the use of tire chains.